NEW 2×12 and 8×10 sizes in Craftsman Style Floor Registers! Now you can purchase any finish in the Craftsman/Mission style floor register in the sizes 2×12 and 8×10! This gives you a total of 8 size choices in this popular design. Find the 2×12 floor register and 8×10 floor register in ALL finishes available in the Craftsman Style! Mission style floor register in Copper finish. 8×10 and 2×12 sizes shown. Flat Black finish Mission floor registers in 2×12 and 8×10 sizes. Find Nickel Floor Registers in 2×12 and 8×10 sizes, Mission style. Have an 8×10 wall register you need to purchase and you cant’ find ANYTHING decorative? No worries! The 8×10 craftsman floor register can easily be converted to an 8×10 wall register with the separate purchase of wall clips. The clips conveniently attached to the metal damper of the floor register with provided screws. You can then easily push register in the wall duct opening. Convert floor registers into wall registers with convenient wall clips. Just attach wall clips with provided screws and the push register into duct opening. The wall clips can easily convert the Victorian, Contemporary or Mission/Craftsman floor register into a wall register. New finishes added for the 3×10Wicker Floor Registers. When traditionally you could only find the 3×10 size in the Polished Brass wicker style, you now can choose from the finishes Brushed Nickel, Oil Rubbed Bronze and Antique Brass. Now match that hard to find floor register size to any decor! Other great decorative floor registers in many sizes available at Installerstore.com. Looking for a bathroom vent cover that won’t rust? How about a plastic wall register for the damp basement? It can be quite daunting looking for a plastic wall or floor diffuser in the size and style you need. Installerstore has many plastic wall registers and floor diffusers available. We even carry the hard-to-find no-rust return air grilles for the wall or ceiling in multiple sizes. Click on any of the photos or links below to go directly to the plastic register or grill on our site. Need help on measuring for the registers or need help on the difference between a register and a grill? Read our earlier blog on this topic. If you need a register or grill made of plastic, we have many different options and sizes available for you. The most popular plastic wall or ceiling register would be the 2-way defection no rust resin register. It is made of ABS high-density plastic resin that is rust-free and scratch resistant. The fully adjustable damper allows for full control of the air-flow. Sizes available are 10×6, 12×6 and 14×6. Don’t need the damper to control the airflow, and you’re just looking for a return grill, we have the perfect fit. The hard-to-find plastic wall/ceiling return air grille is available in sizes 12″ x 6″ all the way to 30″ x 8″. The faceplate is only 3/16″ thick. If you are looking for a thicker faceplate for a baseboard grille, we also have plastic baseboard grilles available! You can find many different styles and colors of plastic floor registers on our site. Our most popular sellers are the Contemporary plastic floor registers available in polished brass, satin nickel, oak, white, and antique brass colors. There’s no reason why you can’t have a plastic floor diffuser without a decorative colors. Because floor registers are put through a lot of foot traffic, there are limited sizes. You normally will not find a large-sized floor register, such as 6×12, in plastic. This is because the larger plastic cannot hold up to foot traffic. We do have many metal options for larger floor ducts/openings Each of these plastic floor vent covers include a fully adjustable plastic damper. Deflect-o brand plastic floor register. White and brown colors available. Satin Nickel Victorian decorative plastic floor register. We have a full selection of decorative floor vents in metal and wood if you need to replace registers throughout your home. Have a 3×10 floor/duct opening in your home, and can’t find ANYTHING in this size? You are not the only one! Odd size duct openings, such as 3×10, 4×8 and 8×10, are usually left out from most floor register lines. This blog is to help those who are lost on the endless search for odd register sizes, find their way (register). Below are photos and links to the styles and colors available in odd register/hole sizes. Click the photos to go direct to the item on our site Installerstore.com. If you don’t like any of the styles, you could always go with a custom made floor grille. This way you can pick which design and finish/color fits your decor. Looking for an odd baseboard register or grille size? We have a full line of baseboard registers and grilles, including a 48″ baseboard register. This hard to find 48″ baseboard diffuser is also available in white and golden sand color. Here in Wisconsin, we saw about a week straight that saw 100+ temperatures with no relief. Air conditioners were running 24/7 and we were all looking for ways to conserve as much as the cool air that was being pumped in the house. Most people don’t realize the energy/cooling loss that happens with common floor and/or wall registers. Common registers will have a single deflection (meaning it only shoots cool air out once) or 2-way deflection (airflow shoots 2 directions). Most registers aren’t placed smack dab in the middle of the room, where the cool air is needed the most. And don’t even get me started with furniture blocking valuable vents. Grandmothers antique wardrobe can only fit in one spot in the living room, that also just happens to be blocking a floor register distributing valuable cool air. Or how about the floor register that is located right next to the window, and the cool air just causes the curtains to dance? Instead of keeping the bottom of the wardrobe cool, there are inexpensive air deflectors that can help you stay cool and save energy. Place your furniture anywhere without blocking your floor vent with the Extend A Vent. Works perfect with dressers, couches, TV stands, and any furniture that allows for the piece to slide underneath. The Extend a Vent saves you on air conditioning by re-directing cool air to the center of the room. The product is 11 1/4″ wide, and is adjustable up to 3ft long! This inexpensive product for keeping your home cool can be found on our website Installerstore.com. Direct airflow away from your walls and up into the room. This clear plastic Air Deflector fits on the top of your floor register using included magnets. The length of the Air Deflector can be adjusted from 10 inches to 14 inches, and the width of the product is 4 1/4″. Because magnets are used to hold the deflector in place, it is best to use these with a metal registers. Installerstore has MANY other deflector choices to help save on air conditioning and electricity listed on our site. We even have air deflectors that can be used with sidewall registers and baseboard registers. Once in a blue moon we get a customer request for the effective area of a register or grille. This isn’t commonly asked because the technical aspect of the answer, and most asking don’t really know what effective area or free area is, but know they need a grille that has a specific effective area for their HVAC system. 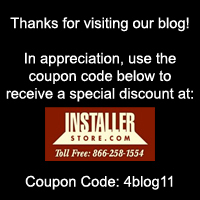 I, nor any sales staff member of Installerstore are experts in HVAC installation or specifications, but this blog serves as a tool to understanding just what the effective area and free area mean. If you have specific requirements for your home, please consult with your HVAC specialists before making any decisions. Effective Area is noted in engineering data of products as “Ak” and is usually measured in square feet. The textbook definition of Effective Area is “The calculated area of an outlet based on the average measured velocity between the fins.”** To break this down, it is a measurement of the grille or register in square feet, that is utilized by air flowing through it – how much of the grille allows for air to flow through. The Effective Area keeps in mind the friction caused when the air makes connection with the bars as it flows through. The Effective Area is calculated by the manufacturer of the grille or register. The Effective Area (noted as Ak) is used in the formula to find the Cubic Feet per Minute (CFM) of the register/grille. Cubic Feet per Minute has to do with the air flow rate in cubic feet that passes through the grille per minute. If you want to find the CFM for a certain grille/register, you would find the particular grille you are looking for in the manufacturers engineering data. Once you find the chart, use your average face velocity (measured in feet per minute– FPM) and multiply it by the Ak listed for that particular grille/register. You can see that the entire equation is in basis of feet and minutes (this will come in handy later for the Free Area Explanation below). For example… if your HVAC system has a velocity of 500 and the grille size is 20×6, using the chart from the manufacturer we can see that the AK (Effective Area) will be .58. We can determine the CFM’s by looking at the chart (it usually is listed) but we can use our formula from above to double-check…. 500 x .58= 290. This matches the CFM on the chart. Let’s say you were looking for a 20×10 return air grille with the highest Effective Area. We can refer back to the engineering data for the return air grilles (manufacturers will usually have multiple styles of grilles). From the charts below, we can see that the 515 – Return Air Grille for the size 20×10 has an AK of .956, while the 500 – Return Air Grille has an AK of .93. The 515 would be a better choice given your face velocity with a higher Effective Area of .956. Getting free area and effective area confused is very easily done. They are similar in the fact that they are both measuring the sum of areas where air exits, aka the spaces between fins “see through area.” The biggest difference between the two terms is that Free Area does not factor in the friction for the air through the bars or louvers on the register/grille. This results in Free Area being a greater number/measurement that Effective Area. The other main difference between Free Area and Effective area is unit of measure. Effective area is in square feet while Free Area is in square inches. The textbook definition of Free Area is “The minimum total area of the openings in the register or grill through which are can pass.”** I think of it as out of the total faceplate, what is the area “free roam” for the air- ie how much of the faceplate allows for air to escape. There is really no formula that applies to free area and almost every return/registers out there will have a different set of input for calculating free area. I find myself asking many times, that if Effective Area is listed on engineering data for grilles/registers and not Free Area, than what exactly do you need free area numbers for? Some Velometer (measures speed of air in HVAC systems) manufacturers require the use of free area. If you are using such meter, be sure to convert the Free Area that is in square inches to square feet. 1)Duct size… Make sure you have the actual opening/duct size of your register. Wall registers or grilles are listed by width (horizontal) x height (vertical). 2)Whether you have a register or return. The register is a supply (air comes out), and comes with a damper to control air flow. A return is an exhaust air inlet to duct, and will not have a damper. Need more info on the difference, see our earlier blog entry Registers vs. Grilles. 3) The face velocity of your HVAC system. This can be calculated by your HVAC specialist using the open area of your duct/fume hood and measuring the airflow with a thermal anemometer. **FPM= Feet per minute. 4)If you are looking for the highest Effective Area, let the sales person know, or let them know what type of engineering data you are looking for. Just a note again that most decorative registers we carry do not have engineering data. If you need something that has a higher Effective Area, choose a design with a larger design/pattern, such as the Victorian Design. We can provide you with any engineering data we have available per request. Please make sure to make your duct opening and face velocity. Tis the season for the thermostat wars! Browsing on the World Wide Web, I found this interesting article on MSN Real Estate on how to properly winterize your home, to save on energy costs. It is entitled “10 ways to winterize your home – now” written by Christopher Solomon. Having spent all of my life in the Tundra of Wisconsin, I have found myself doing a lot of the mentioned things, but not to its fullest potential. Below I have outlined, in my opinion, some of the most important points in this article. For a standard indoor caulk to fix the air leaks, try Colorfast Tile & Grout Caulk or Dap Caulk available in Clear. According to the U.S. Department of Energy, a home with central heating can lost up to 60% of its heated air before that air reaches the vents if ductwork is not well-connected and insulated, or if it must travel through unheated spaces. That’s a huge amount of wasted money, not to mention a chilly house. Ducts aren’t always easy to see, but you can often find theme exposed in the attic, the basement and crawlspaces. Repair places where pipes are pinched, which impedes flow of heated air to the house, and fix gaps with a metal-backed tape (duct tape actually doesn’t stand up to the job over time). Ducts also should be vacuumed once every few years, to clean out the abundant dust, animal hair and other gunk that can gather in them and cause respiratory problems. While you are cleaning out your duct work, why not replaced all your old grungy floor registers and wall returns? Install a Return Air Filter Grille with a washable/reusable Filter help ensure clean air in your home. Read the rest of the article for more great tips on winterizing your home. For more great home improvement items such as transition strips, registers, and floor protection, browse our website Installerstore.com. Here’s to another LOOONG winter! One of the most common returns we receive concerning our floor registers, involves a customer who miss-measured.. They’ve measured the faceplate of their existing register or grille, and ordered using those numbers. This is incorrect for floor registers and grilles. It is an industry standard to measure your duct work or the actual hole in the floor. This blog is explain just what a register is and how it differs from a grille, and how to properly measure and install them. The official definition of a register is “an adjustable, grill-like device through which heated or cooled air is released into a room.” A register most commonly has air coming out of it (whether it be cold air or warm air) and will have a damper to control the airflow. The damper would drop into the hole/opening in your floor, and have a movable plate for regulating the airflow usually by a visible knob the protrudes from the faceplate (this will vary by style of register). Other common names for a floor register include: diffuser, vents, air register, supplies, air outlets, etc. A register is different from a return air grille. Floor return air grilles are used as a return or exhaust air inlets to ducts. Because air does not come out of the duct work, dampers are not included (because there is no forced air flow to control). Floor return air grilles will still have a small drop in area that will go into your floor opening, but there will not be a damper. There is not a wide selection of styles and finishes for floor grilles, and if you have a small enough opening (that matches floor register sizes) you could use a decorative floor register and leave the damper completely open. 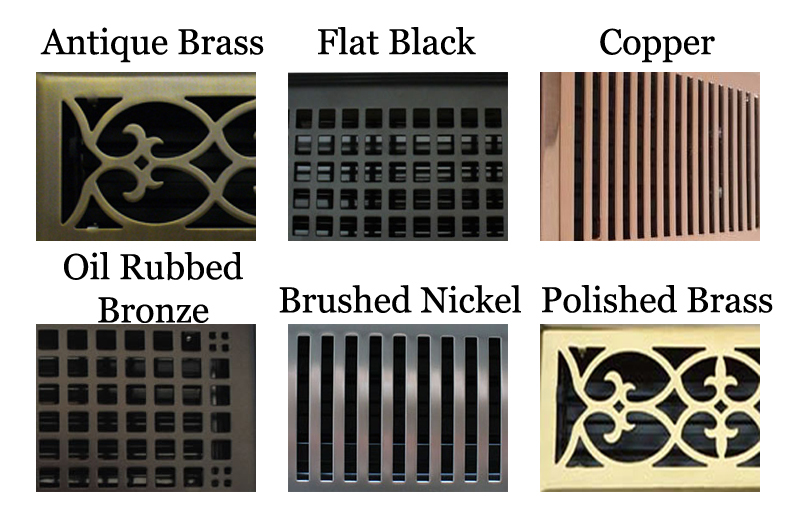 Other common names for floor air return grilles: floor grilles, floor returns, floor grates, etc. It is an industry standard to measure the actual hole/opening in the floor to get the correct size of floor register or grille that you will need. Take out the existing floor register, and measure the length/width of the opening in inches (all registers will be listed in inches). If your duct work/opening in the floor is 4″ x 10″, you’ll need to purchase a 4×10 floor register. It will not matter if you say the length first or the width first, example 10×4 or 4×10, when it comes to floor registers. Most floor register dampers will drop into the hole about 1 inch or so, so make sure you have enough clearance in your duct work for this. DO NOT MEASURE THE FACEPLATE OF THE EXISTING REGISTER! A register/grille faceplate will differ from style to style and manufacturer to manufacturer. The packaging of the floor register or listing on a website, will have the opening dimensions. The faceplate dimensions should be listed in the description- but that will not be the main number identifier, nor will you likely find a replacement register/grille that will have the exact same faceplate dimensions. Standard floor registers and grilles will an even-whole number (measurement)- for example 2, 4, 6, 8, 10 etc. There are some registers out there that can work for 3″ opening sizes- but choices are limited. If you have lets say a 2″ x 11″ opening- you may want to try to extend the hole size by 1″ so you can get the standard size 2 x 12 register. Otherwise you may have to get something custom-made for your opening. **Register listing on our website- Order by hole dimensions, but the faceplate dimensions will be listed for your reference. Once you purchase a register or grille that is a match for your opening size, you may now install it. Hopefully you have left the previous (old) floor register in place (so nothing or no one could fall down in the duct work). Installing floor registers and grilles is a breeze to wall or ceiling registers – no drilling or screwing in anything. Simply take out your existing floor register, and drop in (damper first) your new register. The damper should keep the register in place. If you purchased a register, you’ll be able to control the airflow using the damper control. Haven’t ordered a floor register/grille yet and need help on different styles and finishes available? Check back for an informative blog walking you through the different styles, finishes, and types of floor registers available on Installerstore.com, as well as custom-made grilles! When it comes to finding decorative metal wall registers, you’ll usually come up empty-handed. Most wall registers will be white metal or plastic, and wood (in very select sizes). The good news is there are some styles of decorative metal floor registers that can be used for wall registers. If you have an opening (hole) size that is listed below, you are in luck and can use the decorative floor registers in the wall. If you do not see your size listed, I am sorry but you are back to the white steel register or custom-made grilles. *Make sure you are measuring the actual hole in the wall (duct opening) and not the register cover itself! The following floor register designs are available for wall use……. Different sizes from each line of decorative registers require the use of wall clips (purchased separately) or include knock-out screw holes and matching screws for installation into the wall duct work. The Contemporary and Victorian style registers in size 6×10-6×12-6×14 have knock out screw holes on the front faceplate which allows for easy installation into the walls (matching plated screws included). The remaining sizes (2×10-4×14) require the use of the wall clips. All sizes of registers in the Mission (Craftsmen) style require the use of wall mounting clips. 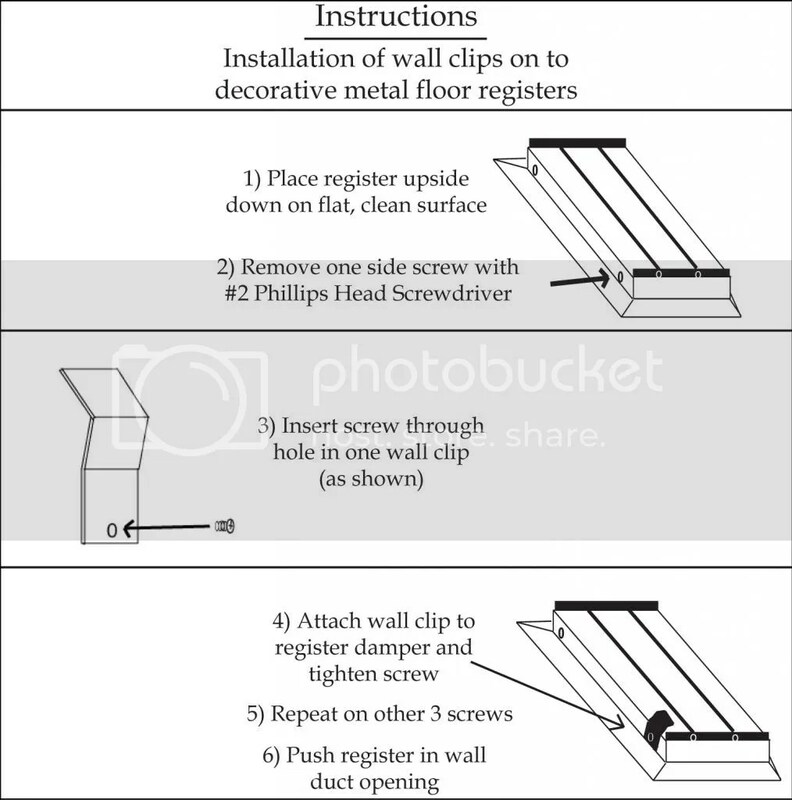 Below is a chart to better understand which registers require wall clips for wall installation and which do not. You can now breathe a sigh of relief for stumbling upon decorative registers for your wall. Below are links to where you can find these registers on our site. Make sure to check back to this blog for instructions on how to attach the wall clips for register installation and how to use the knock out screw holes in the Contemporary and Victorian lines. **Convex Contemporary and Zoroufy brand registers cannot be used with the wall clips. Having troubles opening the faceplate of a triangular baseboard register or baseboard return grille? Installation doesn’t have to be a pain anymore! The question most often asked regarding the triangular baseboard registers is how to open the front faceplate for installation. I’m sure others have come across the same problem, but feel silly for asking for help. THIS IS NOT A STUPID QUESTION. It is a bit tricky, but below are tips to help make the process a little easier. *These tips work best with the standard steel triangular baseboard registers or grilles in sizes 15″, 18″ and 24″ (wicker style as well!). Your objective is to open the front of the baseboard register, in order to access the holes to screw the register into the wall or floor. Hopefully the tips below will make this mission a bit simpler for you. The provided advice is not the “recommended installation instructions” from the manufacturer. We have just found this to be the easiest explanation for customers. Place your free hand on top of the baseboard register for stability. With the hand that is inside of the register, make a “come here” motion. Bring your fingers toward you, to pop off the front plate of the register. You may need to use a little strength in the “come here” motion and you may not open it on the first attempt (it took me 3 times). Still can’t get it? Watch the video below!